In 2019, skywatchers in a few select locations on Earth will have the opportunity to see a solar eclipse, a celestial event in which the moon briefly appears to take a bite out of the sun. On Tuesday, July 2, 2019, the moon will block the sun over the South Pacific Ocean, Chile and Argentina for a partial solar eclipse. Most of this eclipse will be happening over remote uninhabited parts of the Pacific Ocean, where the partial eclipse starts at 12:55 p.m. EDT (1655 GMT). Niue is one of the few countries who will be able to view a partial eclipse during this time. In addition, it’s the beginning of our whale season. Anecdotal international evidence and mounting scientific studies suggest that as the moon moves briefly between the sun and the Earth, much of the animal kingdom will alter their behaviour - including whales. In 2017, the Director of the Fiske Planetarium at the University of Colorado, was viewing an eclipse from a boat near the Galápagos Islands, he saw dozens of whales and dolphins swim to the surface of the ocean five minutes before the eclipse began and remained there until five minutes after the eclipse. Who knows what we might see. 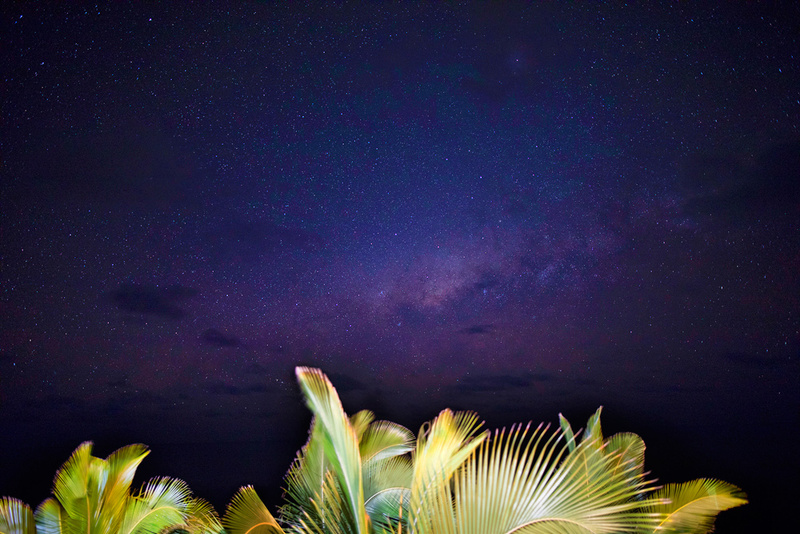 So, to mark this special event we are extending a limited offer for you to be our very first ‘astrotourists’ to join us, staying at the beautiful Scenic Matavai Resort, one of the most outstanding locations for star gazing in the Pacific. Return airport coach transfers in Niue. Management orientation on pool deck. *Rental car is based on 2 passengers travelling together and sharing car hire. Package must be booked by 3 May 2019. Single traveller price, for a 4 night stay from $1699pp. Travel from 2 July to 5 July 2019 (Flight departs Auckland 2 July, arrives in Niue 1 July. Return flight departs Niue 5 July, arrives in Auckland 6 July). From Wellington or Christchurch, please add $160 per person for domestic airfares to/from Auckland. Stephen lives under the dark skies of rural Manawatu, New Zealand. During the day he lectures in astronomy and philosophy at Massey University, Palmerston North. During the night he is a keen astrophotographer and in 2011 his first book, Imaging the Southern Sky, containing over 150 of his own deep-sky images and a personally-commissioned foreword by Sir Patrick Moore, written just a few weeks before he died. Stephen’s deep-sky images have appeared in international magazines, newspapers, scholarly journals and on BBC TV. As the president of the Horowhenua Astronomical Society, Stephen also enjoys inspiring the public to take an interest in astronomy, through combining scientific information with aesthetically beautiful images of astronomical objects. He has staged exhibitions of his work and held presentations showcasing his images using live musical accompaniments throughout New Zealand including at the Aoraki Mackenzie International Dark Sky Reserve. Stephen is also fascinated by the astronomy and starlore of Māori, Polynesian and Australian Aboriginal peoples and how knowledge of the night sky was used by, and helped shape, these cultures. In 2017, Springer published his second book, The Great Canoes in the Sky: Starlore and Astronomy of the South Pacific, which encapsulated his interests in scientific astronomy, astrophotography and starlore in the South Pacific region. In addition the Bishop Museum in Hawaii will be sending one of their science educators from the planetarium down to join in the fun and make sure everyone has a great time star gazing. Please note: Star gazing and eclipse experiences are reliant on clear weather conditions – at the time of publication, clear skies are forecast for Niue, however we accept no liability if viewing conditions at the time are less than optimal.